Who's ready for some March Madness, Canadian Real Estate Edition? It's mid-March, and spring begins this weekend -- signalling what is traditionally the busy season in real estate. The madness in Canadian real estate hit a new peak this week when the Canadian Real Estate Association (CREA) released its stats for February -- noting that the national average price exceeded $500,000 for the first time. In February, the average price jumped 16.4 per cent year-over-year to $503,057. 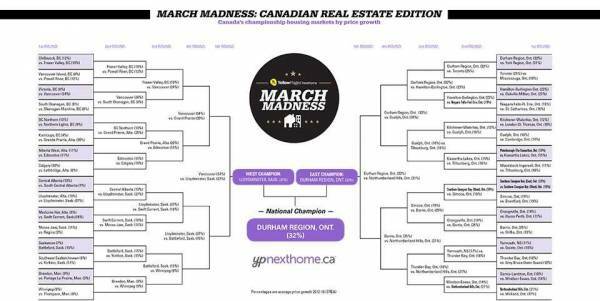 So, in the spirit of the NCAAMarch Madness basketball tournament, YPNextHome put together our own bracket of championship housing markets across Canada. We paired the top proximate markets across the country, using official CREA average price growth as the deciding factor. We chose a four-year window, from 2012 to end of 2015, to provide a longer-term, bigger picture context of market performance. It's East versus West, as city market takes on city market to determine the eventual Canadian slam-dunk champion. Spoiler alert: it's not Toronto or Vancouver. Why did we use a four-year window? Because we thought it would provide a more accurate picture of a real estate market over the long term. There's no secret, for example, that areas such as Calgary and Edmonton are getting hammered due to the prolonged slump in oil prices. In Calgary, for example, home prices declined by 3.5 per cent in February on a year-over-year basis. Ouch. But looking at it over the last four years, the average price has actually risen 10 per cent. Not bad, eh? Forget that CREA says the national average price exceeded $500,000 -- climbing to $503,057 -- for the first time. Sure, it makes for interesting headlines and provides some context on a national basis. But as Toronto-based mortgage expert Calum Ross says: "Saying there is a Canadian housing market is no less ridiculous than saying there is 'Canadian temperature.'" Or that traffic at one end of the country is the same at the other. "Canada represents one of single largest countries in the world and going from coast to coast, Canada is home to a very diverse group of people with local economics that are vastly different," he says. Real estate is local, not national. You don't buy the Canadian market, or even a provincial or regional one. You buy one home in one location. If you're buying a home in Chilliwack, B.C., where the average price is $336,000, or Yarmouth, N.S., where the average price is $125,066 -- what do you care what the national average price is? The fact is, the national average price is heavily skewed by Vancouver and Toronto, as Canada's most active and expensive housing markets. If these two are excluded from calculations, CREA says, the average is a more modest $355,235, and the year-over-year gain is just 8.7 per cent. How did we select which markets face which markets? 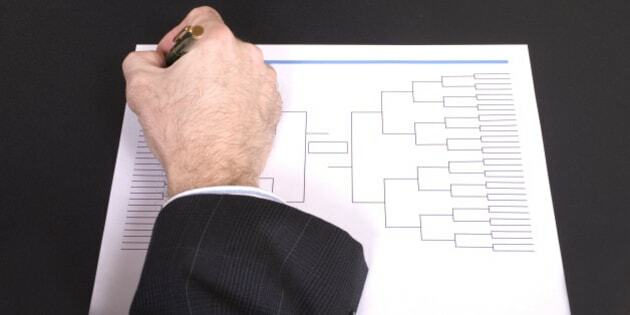 How did we "seed" the markets, using March Madness parlance? Initially, geography. Since real estate is local, market performance is most influenced by the economic fundamentals on a provincial, regional and municipal basis. For example, Guelph would naturally take on Cambridge, since these two markets are barely 23 kilometres apart, and therefore are subject to similar challenges and opportunities in that area. While geography was the key determining factor for which cities face off in the first round, we had to make a handful of exceptions. For example, the 32 city markets in the first round for eastern Canada were all located in Ontario, with the exception of one maritime city, Yarmouth, N.S. To help compensate for the large geographical distance, we paired Yarmouth with one of the Ontario cities located farthest east. And while this still doesn't necessarily make them fair opponents, it wouldn't be March Madness without a little controversy. As certain cities failed to make it past the first round, proximity became less prevalent, and opposing cities advanced to the next round based on which market had a higher increase in home price growth over the last four years. Apologies to Quebec. CREA doesn't collect the same detailed data on this market.